Mitra Purkayastha is an eminent Odissi dancer, dance scholar, choreographer and teacher based in New Jersey. She established her extensive teaching career in 1979 in the U.S. and in 1986 she started her now renowned dance school "Rhythms of Dance and Music" in Morristown, New Jersey. As a child prodigy, Mitra underwent exhaustive professional training in Classical Indian Dance. The first and foremost subject of her specialization is the classical temple dance form of Orissa- Odissi, which she trained under the aegis of the well-known Odissi Guru, Muralidhar Majhi. She continues to seek his training according to the Guru-Shihya Parampara as she visits her Guru every year. Along with that, Manipuri, a classical dance form in the Indian state of Manipur is her other subject of specialization. Since childhood, she has been fortunate to be a disciple of Guru Khelendra Mukherjee in Manipuri. Under the tutelage of Shanti Narayan Gupta and Anup Shankar, she has also undergone formal training in other classical dance forms, namely Bharatnatyam and Kathak. In Mitra’s early career in dance while in Kolkata India, she was one of the primary dancers in Sangeet Natak Academy winner, Manjusri Chaki Sircar’s group till 1978 before moving to the U.S. She has also received Sangeet Prabhakar, Sangeet Visharad and Sangeet Sudhakar diplomas in dance, to give a brief glimpse of Mitra’s rigorous career. After long years of painstaking training, performing and teaching, Mitra has now established herself as a highly acclaimed choreographer and teacher of classical and classical-based creative dance and continues to perform and organize scores of dance shows, performances around New Jersey and beyond, in United States. As a specialty, Mitra’s audiences form a wide-range of demographics, ranging from children to adults of various ages and as a choreographer and teacher, she continues to make a difference through this creative art form in various walks of life, especially charitable groups and organizations for disadvantaged children, autistic population and senior citizens . Mitra has strong, diverse interests in Indian classical music, which she studied under her parents, Sunirmal and Sandhya Purkayastha, who were the disciples of the famous state musician of Rajasthan, Ustad Magat Raj Bhagat of Tilmandi Gharana. 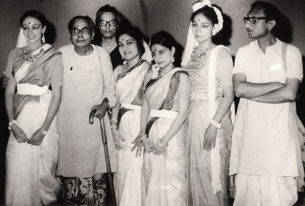 She has also learned Rabindra Sangeet under Debabrata Biswas and Maya Sen of Kolkata. Other than dance and music, she has great interst in academics. She has earned MA degrees in English and History at Kolkata University India and also has M.Litt and MA degrees European History from Drew University, Madison, NJ. Mitra also has a successful career in the publishing industry. Included below is an in-depth, freewheeling interview of Mitra Purkayastha by Anne Paule Picker of Cross Cultural Magazine. Finding time to be interviewed was no easy task for Mitra Purkayastha, Artistic Director of Rythms of Dance and Music, as she keeps a very busy schedule. She is the mother of two boys, works full time and teaches and performs classical Indian dance. After a couple of quick meetings in which I was able to gain some insight into her life, it became clear that her story is one that reflects determination and talent. I also found that her bicultural world shows a balance between tradition and an openness to change. Mitra came here in 1978 and has since learned to live in harmony between her Indian heritage and an American environment. When she first came, the transition between the world she was used to and the new world she found herself in was great. It was at times very difficult for her to adjust to such a different environment. But throughout this transition there was one thing that kept her feeling secure, it was the dancing which she so appropriately refers to as her security blanket. "How was it like a security blanket?" I asked her. "It was security against a cultural shock. It gave me confidence and also a bridge to a new world of new friends, in a new atmosphere, in a new culture." Mitra comes from a family of musicians and artists, so she says dancing was already in her blood. It was the natural thing for her to do. "My grandmother always encouraged us to dance so I started at a very young age. I was four years old when I took my first lessons. My decision to dance was also inspired by my admiration for my mother's sister who was a famous dancer. She was my hero and I wanted to emulate her." Mitra mentions her hero again when asked why she chose to come to the US. Her aunt, Manjusri Chaki Sircar, was living here and Mitra again found herself inspired by this relative's life. As her wish was to come to the US, a marriage was arranged for her with an Indian man who was residing in this country. By the time Mitra left for America, she had a degree in Music and Dance, and had been a disciple of two renowned dance teachers. One of the teachers, Guru Khelendra Singh known as Mukherjee, taught her the Manipuri style of dance for 15 years, while the other teacher, Guru Padmasri Muralidhar Majhi, taught her the Orissi style for 10 years. Mitra's aunt had also been her dance teacher, opening her mind to the possibilities of self-expression in dance. Mitra's aunt became freer in her interpretation of dance as she lived abroad, using Western modern dance as well as her own inventions in her performances. She became very successful and gained recognition within Western society for her creativity. Mitra, however, found that living in the West made her traditionally trained background all the more valuable and prefers to stay within its boundaries. Mitra clarifies what she means by the importance of tradition when she reveals what it is like to teach Indian girls who live in the USA. Dancing is helping these girls stay in touch with their cultural roots. For the most part they have been born and raised here and are brought up differently than they would have been in India. Because of this, they need more encouragement, not only from Mitra, but also from their parents to be disciplined enough to succeed in dance. "The reward is that by studying Indian dance and about its history and philosophy, and by performing at cultural functions, the girls become more connected to their roots and proud of where they come from. When they perform well, they get a lot of acclaim which indirectly encourages them to keep in touch with their culture proudly." While sharing a bit of her k nowledge with me, Mitra explained that there are five different styles of Indian classical dance: Kathak, which is prevalent in the Northern part of India, Bhartnatyan and Kathakali which are from the South, and Manipuri and Orissi which are from the Eastern part of India. "Indian classical dance has its roots in spirituality. It follows the tenets of classical treatise in music called the Natyasastra which has been given to prosperity by its author Bharatmuni. Every step, every hand gesture, every posture, every facial expression convey a meaning according to the classical norm. There are nine different human moods represented, two of which are Sringar, which is love, and Hasya, which means laughter. 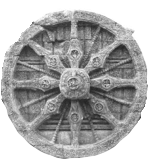 There are ten different types of standing postures, which are called Mandala, and eight different types of gaits (walking) which are called Chari. The five different styles of Indian dance are dramatically different, yet they all follow the basic rules laid down by the Natyasastra." Through her knowledge and vitality, Mitra encourages her Indian students to stay in touch with their culture. Yet her openness of mind stemming from her own cultural transformation as well as her creative background, understands the needs of these more modern and American students. It is also clear from this interview that as long as Mitra can dance and be with dance, she can weather through any changes that her life presents to her. Here is another of Mitra Purkayastha's Interview with a notable media anchor about herelf and Classical dance and Indian culture in general. Q. In India, every single name has a meaning. What is the meaning of your beautiful name? M.P. My name is Mitra which means friend; I'm blessed because I have lot of friends around me all the time. Q. We find that You are not just rich in extensive dance history, but you do have a degree also in Indian history. Tell us a little about your background. M.P.I was born in Rajasthan, in city of Jodhpur and I was very lucky to be born in a family like mine. My parents Sunirmal and Sandhya Purkayastha were both professional musicians and always encouraged me to cultivate and learn art, and go to whatever limits I wanted to. Of course they also wanted me to go to school and to get higher education in history and culture. And so, there I did that when I was in India and I did my masters in English besides indian history...and then when I came here I felt the need of doing a masters in Interdisciplinary history, which I did here; it had history, political science and english, all that combined and I also did another masters in history. I wanted to compare the histories but in my heart my passion is Indian dance and history. Q. Since you have been here, you have taught dance all over in US, not just NJ. Tell us a little about what you have done. M.P. Yes, in NJ I have been teaching since 1986, since the day I stepped here. But actually since the day I stepped in this country, the day after, which was in 1979. Q. India has been described as a continent within a country. What does this mean? M.P. Well it means that India is diverse, it has a wide variety languages, and several hundred dilects, state to state the language differs, food is different in each state but there is an underlying unity-- as we call it a unity in diversity. It is like a salad bowl! Everything is different in the states but the unity is underlying and that is Indian. A person from another state will have a different language but when we talk we talk in Hindi which is the national language and the other language is English. These are the two languages which are binding us. One is the national language and the other is the window to the world. Q. So, once you go to school, you are automatically taught English? M.P. Exactly, we all are little or much, doesn't matter, but everyone knows English or Hindi. Q. As a matter of fact for research, I have realized out that India is actually the most diverse country in the entire world. When you look at India, you see such maginificent temples all over and they represent all of the diffrerent religions. First tell us, about the different religions and then little more specifically about the Hindu religion which is 80% of the population. M.P. One of the things I have to mention is that when we were in school, we used to be very thrilled because we used to get holidays for all the different ocassions. We used to get holidays for Hindu days of worship, Muslim days of Worship, Jewish -- the Zoroastraian faith and of course the Christian and Sikh holidays as well. So, we were very lucky since we got all the holidays from the different religions, which means that we accept everybody, though of course the population is Hindu in majority but still we celebrated with everybody. We, as people are very tolerant and we like everybody to come in and this has been the way for ages. So we have Hindus, Muslims, Sikhs, a very important part of the population, the Christians catholics and protestants, Buddhists, Jains. Q. That I find very interesting-- with a country of over a billion people and it is the size 1/3 the size of US, you have so many religions coexisting, so harmoniously together. How do they do that? How is that done? I think you kind of gave us example, the fact that it is still one India, but I still find that so extraordinary. M.P. Well actually it goes back to the history of India. From even a very long long time ago, India has seen an influx of people coming in through the various kinds. The Moghuls came in, different kings, Mongols came in, Ghenghiz Khan came from Mongol, China-- my point is that India had already been accepting of various cultures from a long time and we have developed this homogeneity from a long time due to this--it was good and bad. Bad being that at that time, a lot of cultures got into a stampede as new ones came on but as a matter of fact it grew and it grew and started acceoting and developed. Q. So, everyone has their own space and everyone respects the other person's religion. That's wonderful! Now, someone says you can't really understand the people of India unless you understand dharma. M.P. Yes, I would say that you are right! Because Hindusim as we know is based on four things-- I have to mention this, one is dharma, the religious piety, the good deeds you do for people for no return, the second is the artha-- which is material wealth for the material world, the kama-- the sensual pleasures for progeny, and lastly the moksha-- the liberation and eternal happiness relaizing the goodness and greatness of God. Q. Did you say Karma or Kama, because Karma--means cause and effect, you didn't mean that! M.P. No, that is something else. Kama is different, the sensual pleasure and KArma is whatever you do comes back to you and if you do a good deed you have to be ready to get something in return. Like my dad used to say, A does something for B and B might not get a chance to give it back to A, but C will come back and give it to A.
Q. One of the things I have also understood is that, in America, the way we are is-- if someone does something that is not supposed to be done, for example if the bus is late, we will complain and will make sure it doesnt happen again. But in India, people will not complain like we do, they rather sit and they pray. So, there is a strong devotion to God and family! Can you tell me a little bit about that? M.P. Sure! One of the things about Hinduism is that we have to know why we do that. Hindusim is called a way of life. We try to do everything as a way of God, we incorporate God and higher being into everything. We know it is because of His blessings and help, everything is happening in this world. So, for anything any event, even if it is any good or bad thing, the first thing we think of is saying some prayers, thanking Him if it s a good thing, and if it not a good thing, praying to Him to make it easier, hold our hands and take us to a better place. Q. Also, the child almost feels a duty to make sure that an ailing or old parent stays with them and almost has a soft passing, it's almost something that is really expected from the Indian culture. M.P. Yes, they feel that parents are the representatives of God on earth, so they feel that they have a moral duty to take care of the elders and parents. Q. That's beautiful! Now, one of the things I have understood is that one of the gifts from India to the world is its spiritual connectedness. Let's face it, you guys have Mother Teresa, you have Dalai Lama, you have Deepak Chopra and you gave us Yoga! What I find most interesting and for me was was very eyeopening, is that India is so spiritually connected. Is it something, that you were taught when you were young? "Dance is my passion, it gives me ecstasy and completeness to my inner self -mind, body and soul. It is my power, my peace, my prayer, my Shakti, my Shanti, my Sadhana". Dance to me is also continuing the Guru - Shishya parampara of our rich Indian tradition, which means passing on the teachings of your Guru to your disciples. It reminds me of this famous shloka by Adi Sankaracharya, "Guru Brahma, Guru Vishnu, Guru Devo Maheshwara. Guru Sakshat Parambrahma, Tasmai Shree Gurave Namaha. (tr: Guru is the creator Brahma, Guru is the preserver Vishnu Guru is the destroyer Shiva. Guru is directly the supreme spirit - I offer my salutations to this Guru)" You can have different gurus for different dance styles, but you must have only one Guru for each style. Only a Guru can nurture the immense possibilities of enrichment and growth in you, enlighten you and guide you to the right path, according to your unique propensities. Being a Guru means someone who has Patience and the Power of Motivation so that the students can believe in themselves. The word GURU is made up of two syllables, GU meaning darkness and RU meaning destroyer - someone who destroys ignorance and enlightens you with knowledge. Guru means not being afraid to impart knowledge irrespective of technical skill, background or age, so long as there is a desire to learn. I have students starting from very young to practically anybody young at heart. I do not discriminate age. My greatest achievement as a guru is not merely winning accolades and prizes, but to see them all bloom into confident dancers with an everlasting passion for their art form, so that they can further their quest for excellence. I encourage Mother-daughter participation, following the Suzuki method of teaching, and I have many success stories. Teaching disadvantaged kids and adults is also something I take seriously and passionately. I believe in - THE AUDACITY OF HOPE AND THE AUDACITY OF FAITH IN THE STUDENTS. Only If we have that, we will be able to impart to our next generation, our rich cultural heritage - our Nritya Yoga or Prem Yoga which Lord Nataraja bequeathed to his disciple Tandi for the spiritual bliss of common man.